PanARMENIAN.Net - In a compilation of what TIME calls crusaders who are keeping the dream of democracy alive, the magazine has spoken with four people, including Armenian Prime Minister Nikol Pashinyan, who have fought to defend democracy in their countries, about what inspired them and what it takes. An opposition politician, Pashinyan led the protests that toppled then Prime Minister Serzh Sargsyan in April and shortly after became the nation’s leader. 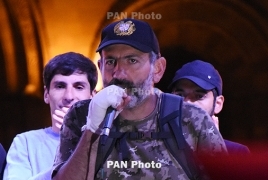 "It was love for my people that forced me to get out of my comfortable office as head of a parliamentary faction and spend about 20 nights in the woods, the streets, in a tent, in protest at the government led by Serzh Sargsyan," Pashinyan said. "I had no personal motivations. All I wanted was to win freedom and happiness for my homeland and people. I said that if citizens took to the streets in the hundreds of thousands and power did not change, I would no longer engage in political activities. From the very first day, we kept saying we would not resort to violence against anyone, even if we were met with brutality. From the podium, I said we would be guided by a biblical verse: if someone slaps you on the right cheek, let him slap your left cheek too. We knew we would never retreat." Now that people have triumphed, Pashinyan said he will honor his commitment to ensure that their victory lasts. "I am convinced that we will move forward in building democracy, fighting corruption, establishing an independent judiciary and rule of law, and protecting human rights and economic competition," he said. "For us, democracy is not a component of regional interests or foreign-policy orientation but a reflection of values and convictions. I believe Armenia will be one of the world’s strongest democracies." The three other "crusaders" are Human Rights Defender Farida Nabourema from Togo, Nobel Peace Prize laureate Ouided Bouchamaoui from Tunisia, and opposition leader Enrieth Martínez from Nicaragua.